The world is changing and Nigerian outfits can not afford to be left behind. Sometime ago, i over heard a conversation about the trouble of registering a company at the corporate affairs commission and it wasnt pleasant to my hearing because one aspect which this post tends to highlight was so exhausting. Its the name search! It involves atimes the frustrating process of scripting a name for your business only to get the notification that it has been taken and to make matters worse you pay for every name search that didnt yield positive result. Kudos to CAC as a search form has been integrated into CAC Nigeria online portal, to enable anybody carry out a search for registered incorporated trustees, company or business names and those undergoing business registration. If you want to register your company or business name with CAC Nigeria, you can also use the CAC public name search portal to check if your proposed business name is available. 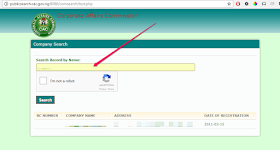 If you enter a registered company name in the CAC online search form, the search result will display the company registration number, the company name, company address and date of incorporation (registration). If there is no registered business name in CAC database, the form/search result will return a blank result. If your proposed business name has not been registered, you can proceed to submit it for reservation at CAC online website or the physical office nearest to you. Said change! We would like to hear from you.